Blaise Pascal Magazine is a magazine all about Delphi, Delphi Prism, Pascal and related languages. 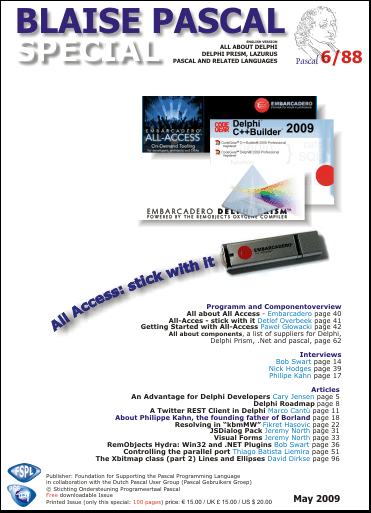 For a limited time, Blaise Pascal is offering Embarcadero customers a 100 page special issue of their magazine as a free download, plus a free one year electronic subscription for registered users of the 2010 and 2009 versions of Delphi, C++Builder, Delphi Prism and RAD Studio. Learn more about Blaise Pascal Magazine at their web site http://www.blaisepascal.eu/. Limited time offer - expires December 23, 2009.